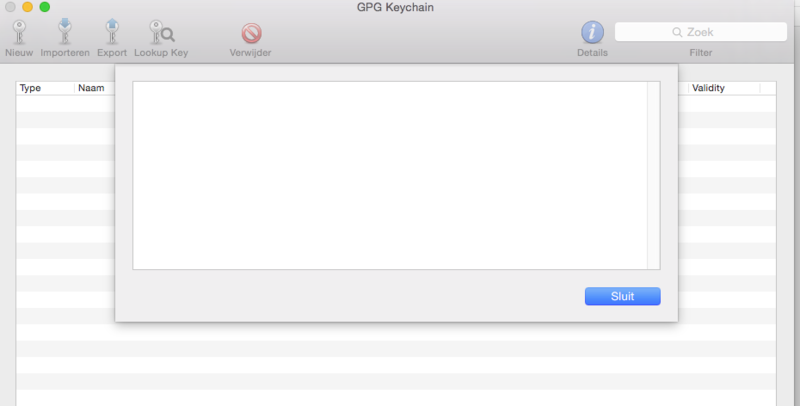 After updating to Yosemite on an iMac from 2007 and installing PGPtools the gpgkeychain was empty. When I installed it last week on a Macbook, gpgkeychain still had the data of the previous version. GPGmail was updated to the latest version. Ken, from what I see, we are looking at two separate issues. Would you please create a new separate discussion for the issue you are seeing. That is the best case to get your problem fixed quickly. Even should your problem be the same, we can then connect it to the same ticket and send you potential quick fix versions much easier. I have to go, further help will be for tomorrow! would it be possible to have another debug session via TeamViewer tomorrow? I will mail you the moment i'm home. I guess about 16h Brussels time. sorry, but would you have a few minutes still now to try another thing. If this works I have a better idea of what to fix. I think I have a working version now. this issue is fixed. Please download and install the MacGPG2 nightly from https://releases.gpgtools.org/nightlies/ and see if that fixes the problem. Steve closed this discussion on 29 Nov, 2014 08:10 AM.